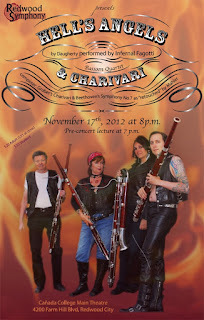 The Redwood Symphony presents "Hell's Angels & Charivari" on Saturday, Nov. 17 at 8 p.m. in the Main Theater. Maestro Eric Kujawsky will offer a pre-concert lecture at 7 p.m. The cost is $25 for adults at the door and $10 for students. Adult tickets can be ordered online at www.redwoodsymphony.org for $20. The concert begins with Charivari, from the demented mind of H. K. Gruber. Spoiler alert! The first surprise comes at the onset: the work begins with a complete performance of Johann Strauss Jr.'s Perpetuum Mobile, but then morphs into a somewhat sinister, nightmarish version of that piece. 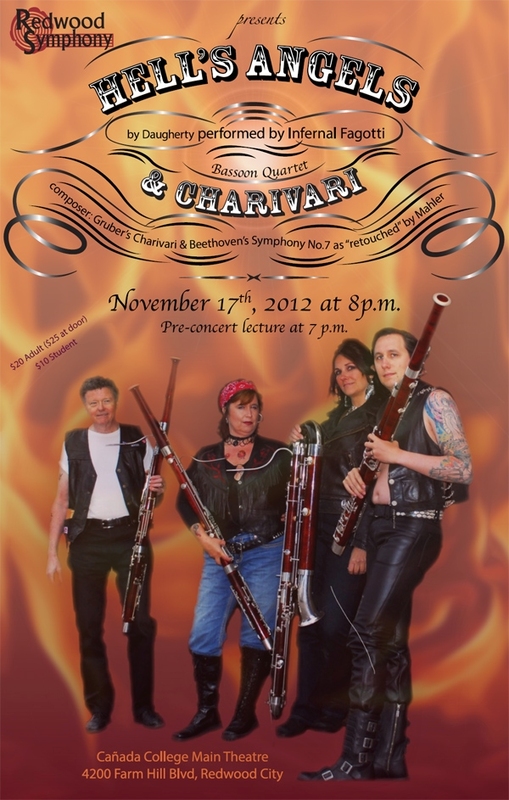 Next comes Hell's Angels, a concerto for four bassoonists who are ready to rumble. Conceived as part theatrical experience, the work will delight you with its catchy tunes and make you laugh as well! Of special note is the percussion section, augmented by siren, thunder sheet and Hammerblow of Death! Rounding off the concert, a perennial favorite with a new twist: Beethoven's Symphony No. 7, as "retouched" by Gustav Mahler.